... test your telescope mirror quickly and precisely with an improved Foucault Test! VCS simplifies and improves retouching (e.g. parabolizing) telescopic mirrors. 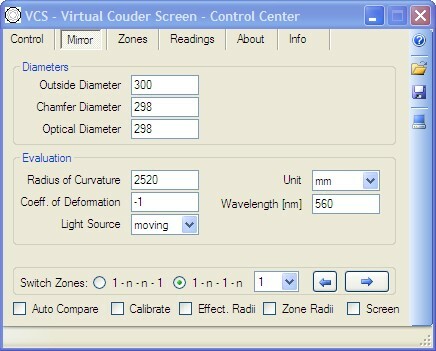 VCS emulates Couder-like zone screens on a computer's display - no diffraction effects and no need to have a real screen any more! VCS compares zones automatically! All you need is an adequately resolved real-time Foucault shadowgram available on your computer (e.g. using a webcam). Immediate calculation and graphical display of lateral aberration, transverse aberration and surface error profile. VCS runs completely independent of the (web-) cam you use, as it is a stand-alone application that does not interfere with the cam's software in any way. The virtual screen can be positioned precisely on top of the shadowgram and thus only covers this part of the display - nothing else. All loaded applications remain visible and usable without any restrictions. Please note: This software is not tested on Windows 8! The software was developed under MS.Net Framework 3.5. Check your computer if this framework or a higher version is installed! It is recommeded to run Windows with an administrator account! In case of problems please go to section Troubleshooting! Unpack the zip-file and move file Virtual Couder Screen.exe to a folder of your choice (empty folder is recommended). Unpack the zip-file and replace the current file Virtual Couder Screen.exe with the new one. Mirror-positioning, adjustment and centering of knife edge as well as showing the shadowgram on a computer screen as usual. Do not use a very low cam- resolution or a high jpg-compression rate (which can be set for some cams). High compression reduces information ad results in unwanted pixeling. 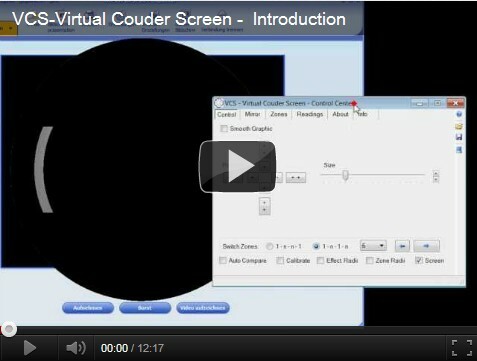 Start VCS - Virtual Couder Screen. You have to accept the license agreement first. => All subsequently outlined settings have to be defined only once, the tool keeps these data - not necessary to start from scratch every time. Define the mirror's various diameters here. Please note, that it is the optical diameter, which defines the outer diameter of the screen's outer zone! The Chamfer Diameter is important for screen calibration. All diameters shall be measured as exactely as possible! This coefficient defines the mirror's DESIRED surface. Defines whether the light source is fixed or moves with the knifeedge. The base unit you use for radii and diameters. Millimeters or inches are possible. 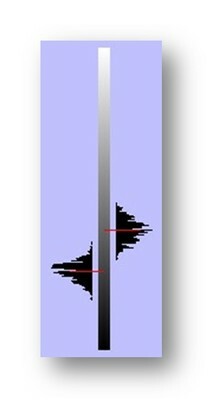 The wavelength of radiation used for calculating the theoretical diffraction spot radius (Rho). Usually the value 560 nm, to which the eye is most sensitive, is used. This value must be given in namometers [nm]! Use slider 'Size' to vary the screen's size. The 'Position'-buttons are for centering the couder screen exactely on top of the mirror's shadowgram. 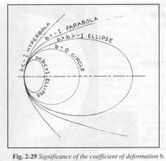 You will see a red circle representing the Chamfer Diameter as defined previously. It is recommended to withdraw the knife edge completely, so that the mirror is brightly illuminated and the chamfer defines the the visible diameter! Now correct size and position of the red circle until it exactely matches with the edge of the mirror's reflecting area. That's it! It is recommend to check the couder screen's calibration from time to time (e.g. after each set of readings). Always use functionality 'Calibrate' to calibrate the couder screen's exact size and position. 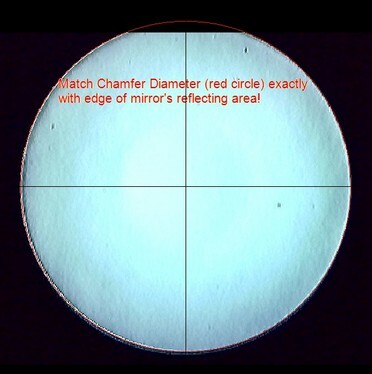 The (red) Chamfer Diameter is the only diameter that may be used for matching with the mirror's reflecting area!! Smoothes edges and lines. 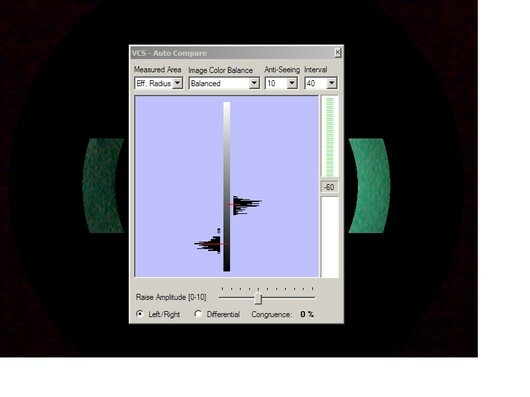 Use this option carefully, it often just produces a pretty picture but does not increase the precision of measurements. => It is informative to make a simple pin stick, where the pins (nails) mark the exact position of the mirror center as well as the outer zone's effective radius. Position the pin stick in front of the mirror and switch on the effective radii (checkbox 'Effect. Radii'). The pin stick helps to verify the screen's calibration. The screen can be positioned with display-pixel resolution. 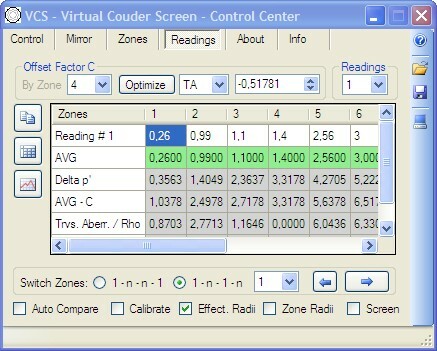 The better your cam's resolution is, the more accurate the virtual screen can be calibrated and the more exact are your zone readings. If the mirror diameter is 350mm and the shadowgram on screen has a width of 500 pixel you get a resolution of about 350/500 = 0.7 mm/pixel. Do not use high jpeg-compression rates (which can be set for some cams). High compression reduces information ad results in sub-pixeling. => For executing Foucault it is not necessary to have the entire mirror on the display. It is a good idea to zoom in as far as possible so that the shadowgram fills almost the full width of the cam's field of view (top and bottom mirror areas are clipped then but this does not matter in this case). This tab offers a great variety of methods for dimensioning your preferred screen zones. Defines the number of zones you want to use. 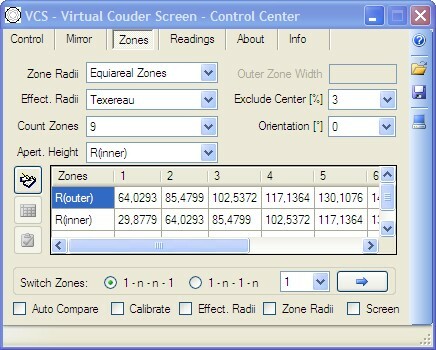 Select the method how to calculate the inner and outer zone radii here. Defines the width of the outer zone. Only of interest in case 'Zone Radii' is 'Equiareal + Outer Width'. Defines the method how to calculate the 'effective' zone radii (or, as N. O. Carlin calls them, 'corrected center radii'). Texereau ... arithmetic mean (See How to Make a Telescope, 2nd Edition, 2.31) In case the readings shall be evaluated using the VCS intrinsic functionalities it is recommeded to select this type of effective radii! The height of screen's apertures. Values can be defined as invariable for all zones or as growing with zone index. The percents of area that shall be excluded in the mirror's center. Screen apertures can be pivoted; this may be usefull for quick testing for astigmatism but needs the knife edge or slit to be rotated accordingly!! Besides the various algorithms of automatical calculation of zones VCS offers a way to enter radii by hand. 'Toggle 'Manual Entry Mode'': Toggles the zones grid between editable and readonly mode. 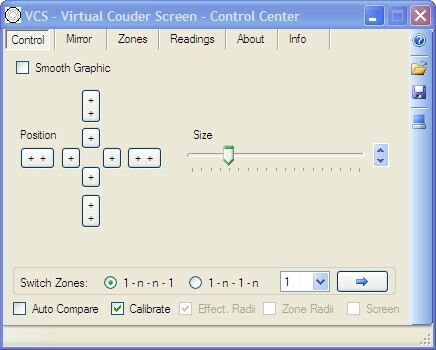 'Accept Grid Values': Press this button after all values have been entered in order to redraw the screen with the current radii. Always have a look at the status line (at the window bottom). It displays short infos in case of inconsistencies! Keep the grid in Manual Entry Mode as long as you want to use the manually entered values. Switching back to readonly mode will replace your entries by automatically calculated values! All entered values as well as the grid's status (editable or read only) are kept and reloaded with next launch. Use the checkboxes at the bottom to switch effective radii, zone radii and the couder screen on or off. The Foucault Test is executed zone by zone as usual. With a single mouseclick you can move to the next zone. 1-n-1-n: Pressing button '=>' zone apertures are shown starting from zone 1 till zone n and then switch back to 1 again. In this case there is an additional button '<=' available which always shows the next inner zone. Combobox 'Readings' is for definig the number of series of readings you want to perform. As soon as the readings are complete average values are calculated automatically (row AVG). All readings are kept and reloaded when the application is relaunched or if a configurationfile (*.vcs) is loaded. As soon as all readings have been entered, VCS performs an automatical data evaluation. It is important to mention that this evaluation is according to the algorithm used by Jean Texereau ('How to Make a Telescope, 2nd edition, chapters 2.38 - 2.41). No doubt, this approach has its limits in terms of absolute accuracy, but - despite that - gives a good impression of the mirror's current quality and instantly tells the mirror maker where the surface needs further retouching. To my mind these evaluations are sufficient for a great part of the parabolizing process. When finishing the suface, it is of course recommended to transfer the readings that have been retrieved so precisely with VCS to other evaluation programs that are specially designed for this purpose and thus deliver more detailed results (Strehl-value etc.). Figure XP or Andreas Reifke's Focault Test Analysis can be recommended. To carry out the evaluations, VCS needs to know some further data about your mirror. Please define these in tab 'Mirror'! This is the arithmetic mean of the entered readings. The distance between the axial intersection of rays from a specific zone and the axial intersection of the central mirror rays for the perfect figure. 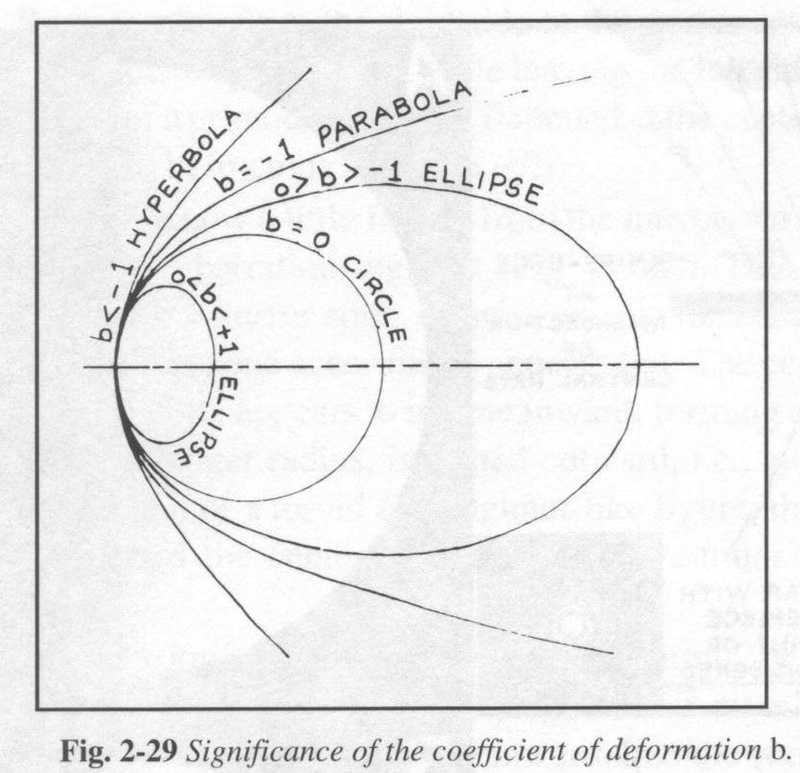 where k is the coefficient of derformation, h the effective zone radius and R the mirror's radius of curvature. This is a constant that will equalize as much as possible the deviation in either direction from the perfect figure. 'Optimize TA'. This triggers an automatical optimization of factor C until the extrema of transverse aberrations (TA) are equal and opposite in sign. The procedure is very much comparable to the process of focusing at the finished instrument. The focus is moved to a position that delivers the best picture. 'Optimize StD'. Varies factor C until the surface StD (Standard Deviation) error is minimal. Optimizing the StD error is often helpfull to find a balanced surface profile that indicates where the mirror needs further correction. All evaluation results can be shown in form of graphics. These are of course updated real-time as soon as any parameters or data are changed! Press Button 'Show Graphics' to open the 'VCS - Graphics' window. The distances between the two graphs represent the actual longitudinal aberrations. The graph shows the relative transverse aberration, i.e. transverse aberration divided by theoretical diffraction spot radius (Rho). If the entire graph is inside the green boundary-lines at +/- 1.0 the mirror meets the Raileigh Criterion and the wavefront error is less than Lambda/4 PV. The displayed ratio Maximum is less than 100% then. The closer the graph is to 0 (and the nearer ratio Maximum is to 0%) in all zones, the better is the mirror! Press 'Optimize TA' in tab 'Readings' to optimize the transverse aberration automatically! 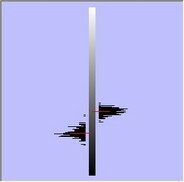 The graph represents the actual surface errror indicating the zones where the mirror needs further correction. is measured on on surface (Sf). Double this value to get wavefront error. Please note, that this error only represents the currently measured mirror profile and NOT the entire mirror. Do not mix this up with RMS Errors delivered by interferometry! Note: The error figure depends on offset factor C. Increase or decrease C to get a well-balanced profile - e.g. optimize for minimal surface StD error. => As you can see in this example, the mirror - measured in 12 zones - is quite good but needs further correction at the edge. Pressing button 'Create Report' compiles a report containing the graphics and other important informations. This report is then available on clipbord and facultatively can be saved to a file. VCS provides several mechanisms that support the user with comparing the zonal brighnesses. Both zonal apertures are scanned in short intervals (typically 25 times per second), the color information of each pixel is then converted to grayvalues and finally the frequency of grayvalues is shown as histograms - one histogram for each aperture. The form of the histograms as well as their centroide's vertical distance allows a precise rating of zonal brightnesses. => To use Auto Compare it is strongly recommended to set the computers color resolution to 'True Color' (32-bit)Do not use any kind of pin stick or other equipment positioned in front of the mirror that is visible in the zonal apertures. This would produce wrong measurements! To launch Auto Compare just check the 'Auto Compare' checkbox in the Control Center's bottom row. Anti Seeing is often helpfull to reduce the influence of turbulent air ("Seeing") when comparing the zones. The histograms and other displayed values are then the moving average of past n samplings. An interval of 40 milliseconds yields a rate of 25 samplings per second. Find a value that is appropriate for you. Set this field according to the color saturation of the evaluated shadowgram. This determines the algorithm used to transform screen pixel colors to grayvalues. Select this if the shadowgram is color-neutral or has a moderate color cast. With this setting the conversion to grayvalues uses a formula that includes all three color channels. Select this, in case the shadowgram has an intensive green hue. Solely the green color channel is evaluated then whereas red and blue channels are skipped. It is recommended not to use red-, green- or blue-saturated shadowgrams, but to reduce color saturation to a moderate amount. Most cam-drivers allow to set the cam's color saturation parameters in a way that the the cam already delivers grayscale images. If possible this is strongly recommended! In this case any fine-tuning as mentioned above can be skipped. Setting 'Image Color Balance' is then irrelevant! When selected, VCS works similarly as you do when comparing zones visually. It evaluates the overall zonal aperture (marked red) and calculates the histograms basing on all these pixels. In this case VCS selectively evaluates a thin line that exactely matches the zone's Effective Radius (again marked red). Up till now it was necessary to work with relatively wide zonal apertures, as the human eye fails when comparing extremely narrow zones (because of diffraction and other effects). Unfortunately these wide zones show brightness-gradients, so that - in consequence - finding a fitting effective radius is essential. Over the time various formulas for calculating effective radii have been developed, though all of them are still approximations (see the formulas defined by Texerau, Couder, Carlin or others). This is no longer a problem with VCS! 'Auto Compare' internally works as if there were zones that are only one pixel wide. Such narrow "zones" cannot show brightness-gradients. Finding the suitable effective radius is no longer critical as the evaluated (compared) areas and the radius generally are one and the same! The user can be sure, that the readings he gets at the measuring instrument strictly correspond to the effective radius - however this radius is defined. This way he can calculate the mirror's current curvature with significantly higher accuracy. Histograms normally are slimmer and thus their congruency can be determined more exactely. Frequencies of brightness (resp. grayvalues) can be displayed as either a separate histogram for left and right screen aperture or as a single differential histogram. To get a differential histogram, the difference between left and right histogram is calculated and then plotted as absolute values. The screenshots shown here both base on one and the same state of zonal apertures. Use the option buttons at the bottom to toggle between the types of display. According to the Foucault Test's theory both zonal apertures will be dimmed equally and simultaneously, when the knife edge is moved sideways towards the optical axis (OA) and in case it exactely hits the current zone's 'center of curvature (COC). => Zone apertures or effective radii (depends on setting 'Measured Area') that change their brightness equally and simultaneously will show histograms whose centeroids move up and down the vertical grayscale-axis exactely congruently. In case 'Measure Area' = 'Aperture', asymmetrical or vertically stretched histograms often indicate that zones are too wide. Apertures of optimal width produce histograms that are bell-shaped and ideally of equal amplitude left and right. In both histograms you can see a red pointer line. This line always marks the centroid of the overall histogram. This is a classification number describing the congruence between left and right histogram. 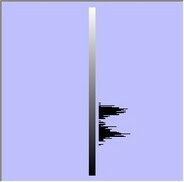 Use this slider to raise or shrink the amplitudes. Attention: Peak values may be clipped this way! Step 1) Before testing, let the mirror remain on its support for several hours. A uniform mirror temperature is important. Step 2) Adjust the knife edge quite perpendicular to the optic axis. Step 3) Carefully align the knife carriage rail parallel with the optic axis by noting that penetration of the knife into the beam is unchanged as the carriage moves towards or away from the mirror. To do this, start with the knife edge at the center of curvature for the small central area and move it laterally towards the optic axis until you get the shadowgram clearly visible. Now move the knife edge back longitudinally until the crest of the doughnut has reached the mirror's edge. Here again the shadowgramm has to be clearly visible. If not, adjust the testing apparatus until the doughnut's crest can be well seen when moving across the entire mirror. Now secure the Foucault apparatus firmly to the support. Step 4) Before toggling the couder screen to visible, take care that the mirror is uniformly illuminated (the knife beeing completely out of the beam), also the cam's parameters should be set in a way that the image is not overexposed (reduce Iris or dim the LED). Now start, for instance, with zone 1. Move the knife edge along the optic axis until you find the position where both sides darken uniformly (distance between red pointer lines = 0) when the knife enters the beam. Take a reading for this zone and write the value to the corresponding cell in the readings grid. Step 5) Switch to zone 2. To locate this zone's center of curvature draw the knife longitudinally until the distance between the histograms is zero again (no lateral movement necessary!). Take a reading. Step 6) Repeat step five for all other zones. Is there an optimal lateral position of the knife edge when making the measurements? 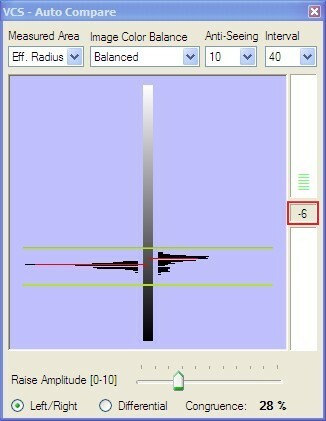 Yes, tests have shown that the lateral knife edge position is optimal when the histograms are vertically situated in a range that is defined by the green lines as shown in the picture. 'Save Configuration' for writing the current software status (all settings, radii and readings) to a configuration file. 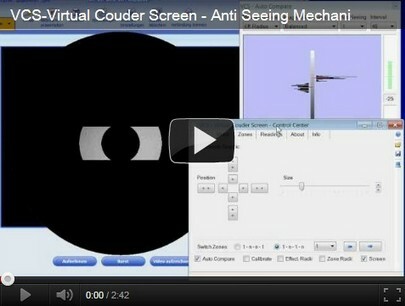 VCS - Virtual Couder Screen© is shareware. Within a trial periode you can use all functionalities without any restriction. Please register the pruduct in order to use the software after the trial period has expired. •	Automatic evaluation of measured data. •	Immediate calculation and graphical display of lateral aberration, transverse aberration, and surface error profile.